(daily telegraph.co.uk) The Queen and Duke of Edinburgh were joined by Prince Charles, the Duchess of Cornwall and the Princes William and Harry for the service at St Mary Magdalene Church near Sandringham House in Norfolk. The Princess Royal and her husband Timothy Laurence, the Duke of York and his daughters Princesses Beatrice and Eugenie, and the Earl and Countess of Wessex also attended. Onlookers traditionally gather to see members of the Royal Family walk from Sandringham House to the nearby St Mary Magdalene Church. On Christmas Eve, William and Harry took part in a traditional festive football match on the estate, joining estate workers in an informal game at Castle Rising near Sandringham. The service comes ahead of the broadcast of the Monarch's speech which, last year, the Duke of York revealed the Queen sometimes watches alone to see if it comes across in the right way. The Queen will use her this year's message to talk about the concern people are feeling over the economic downturn. With unemployment rising and figures showing Britain heading into a recession, the Queen will say this year's celebrations will be overshadowed for some by fears about the future. She will also highlight worries caused by conflict in countries such as Iraq and Afghanistan. The Queen will address the impact of economic "insecurity" on family life in her Christmas message, reflecting that this year's festivities will be "more sombre" for many. She will stress the importance of the family during the economic downturn during the broadcast, which will also include rare film footage of Prince Charles as a baby. The tone of her message acknowledge that Britain faces rising unemployment and uncertainty in the financial markets. In the address, filmed in the Music Room at Buckingham Palace, the Queen highlights the support she and the Duke of Edinburgh receive from their own children and grandchildren. The point is underlined by photographs on a grand piano behind the Queen of Prince William and Prince Harry in their Army uniform, next to one of the Prince of Wales in his flying gear when he was in the Royal Navy. There is also a photograph of the Duke of Edinburgh and a black and white one of the Queen and Duke with their children. The broadcast, set against the backdrop of one of the severest recessions of the Queen's reign, comes after she privately urged the Royal Family to respect the difficult times the country faces by avoiding overt displays of extravagance. In her address the Queen acknowledges that many of her subjects have been hit hard by the economic slump. "Christmas is a time for celebration, but this year it is a more sombre occasion for many," she will say. "Some of those things which could once have been taken for granted suddenly seem less certain and naturally give rise to feelings of insecurity." The broadcast will feature never before-seen private footage of the then Princess Elizabeth, aged 23, and Prince Charles in a drawing room at Clarence House in 1949 when he was one-years-old. Princess Elizabeth and the Duke lived at Clarence House after their marriage in 1947 until she succeeded to the throne in 1952. Clarence House then became the home of Queen Elizabeth, the Queen Mother and is now the official London residence of the Prince of Wales and Duchess of Cornwall. The black and white cine film is part of the Royal Family's own personal archive which is kept in the vaults of the British Film Institute. 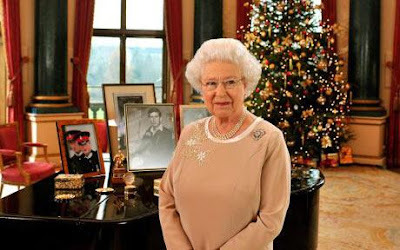 The Queen, who approved the film sequence for the Christmas Message, had not seen it for years. Gowns: Nannie; Make up and effects: Boyoh Brownovich. The future Queen dictated the cast list. The nanny who chose the gown for the Prince was Helen Lightbody, who worked with him until two weeks before his eighth birthday. Miss Lightbody, who was nicknamed 'No Nonsense' Lightbody, never uttered a word about her experiences and retired to a grace-and-favour apartment owned by the Duchy of Cornwall. She died aged 79 in 1987. The film footage is warm and extremely personal and underlines one of the themes of the Queen's message about the importance of the family in difficult times. 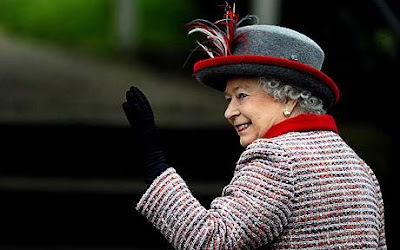 The Queen will spend Christmas with her immediate family at Sandringham, her Norfolk residence. The Queen also pays tribute to the unselfish work of the voluntary services at home and abroad and to the role of Armed Forces especially those involved in active service in Iraq and Afghanistan. Prince Harry became the first member of the Royal Family since the Duke of York in the Falklands in 1982 to serve on the front line when he went on secret assignment in Afghanistan for 10 weeks. The Queen, who is head of the Armed Forces, gave her approval for third in line to the throne to go to Afghanistan. The Prince of Wales, who celebrated his 60th birthday in November, is also singled out by his mother who pays tribute to his lifetime of public service. The broadcast, produced by the BBC, will be transmitted at 3pm on television and radio on Christmas Day and will also be available on the Royal Channel on the YouTube website from the same time.